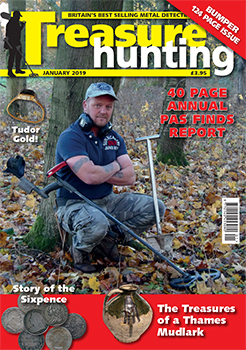 Bumper 124 page Special Issue! The Portable Antiquities Scheme Annual Report – Amazing 40 page summary of the work of the PAS, showcasing some of the most interesting finds recorded during the year. Tanner Tales – John Keen takes a look back at the history of the sixpence through the ages. Using Your XP Deus to Find ‘The Last of the Treasure’ - Gary Blackwell – Tips and Techniques for well-searched sites. Feisty Ferrets and Fallow Fields – Denise Moncaster presents a selection of her latest finds. The Mudlark Treasures of Mark Paros – Jason Sandy interviews veteran mudlarker Mark Paros andpresents 15 of his favourite finds. The Beast from the East Chris Williams – The great storm of March 2018 uncovers some lovely treasures on the beach. My Fifteen Year Treasure Quest – After 15 years of detecting, Owen Baldock makes his first ever Treasure find. Plus all our regular features, including News and Views, Reader Finds and Club Round-up.